Do you remember my rainbow cut crease makeup from last year? Last year I hid the rainbow in my eyes – having deep set & hooded eyes can be beneficial for hiding secret messages on your lids. But this time I wanted it to show more, so I did another version of it. I even made a little tutorial, so rainbow cut crease 2.0, here it is. What comes to the pride week and pride, I’ll just say one thing, that is a no-brainer for me: love is for everyone. It’s your personal business, but also it’s something that connects us and so it’s really everyone’s business. Right? There can never be too much love in this world. 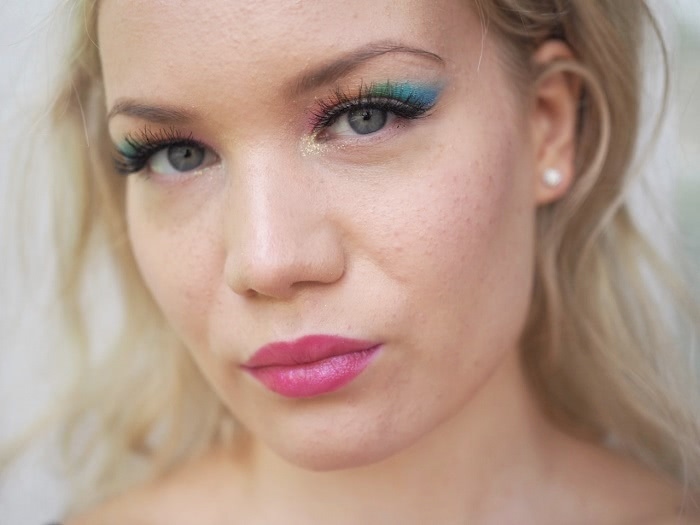 And now: Check out this tutorial for creating a colorful rainbow cut-crease. It’s easy to create with a white pencil as a base and some colorful eyeshadows. Again, I wanted to show you the steps eyes closed and open, because with my eye shape it’s how I work. I always check out the color placement eyes open, so I see how the makeup actually looks, when I’m talking to people. Prime your eyes the way you like. I used Urban Decay’s primer potion and I set it with light eye shadow. 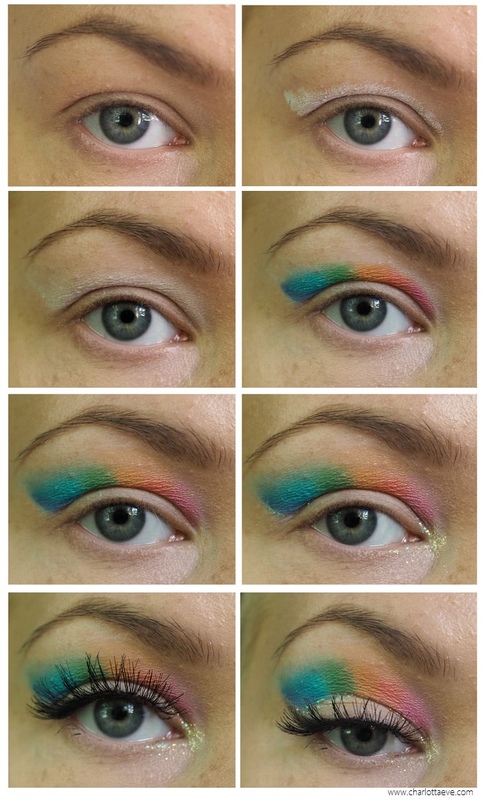 Create the rainbow shape on your eye, so that it shows when your eye is open, but still so that the brightest color is still a bit hidden. Blend the white pencil carefully. Start applying colors to the white base. I used three different shades of blue, green, yellow, orange, pink and a touch of red. Use any colors you like. Pack the colors on to make them as bright as possible. Blend the colors carefully so that they ‘blend in’ towards your brow. Cut the crease using a glitter liner. Apply the glitter liner also in your inner color to make it super bright. (There’s a treasure at the end of the rainbow right? Here it’s glitter.) I applied a loose glitter on top of the glitter liner to make it, you know, even more glittery. Tighline your upper lashline and create a wing. Make sure the wing meets the other end of your rainbow. Apply mascara and lashes. All done! What do you think? Which version do you prefer, last year’s or this? Video – How do I apply makeup on hooded eyes? Pitäisi kyllä itsekin vihdoin kokeilla tehdä jonkinlaista sateenkaarimeikkiä, monesti ollut mielessä, kun nuita värikkäitä luomivärejä kyllä löytyisi itseltäkin :D.
This is such a fun look, I love it! 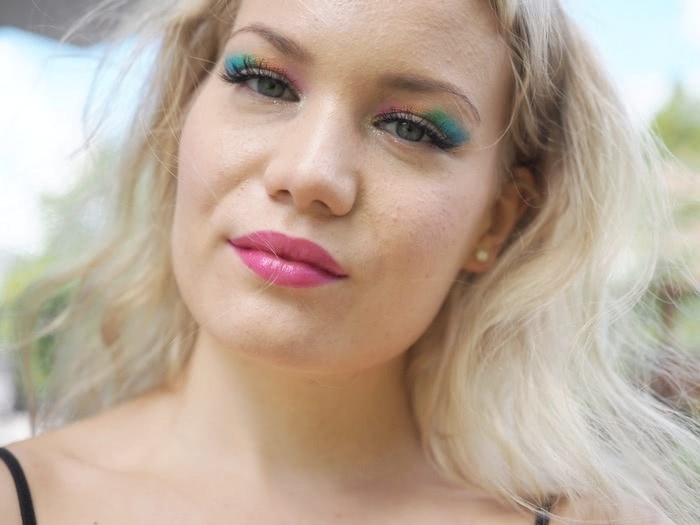 I have hooded eyes too so always wear my makeup above the crease, really like how colourful this look is. Wow look amazing babe! I will never can do this good. Great tutorial, truly inspiring, I love it, love your amazing blog as well. Thank you for sharing, you look stunning!!! Charlotta | 24-year-old beauty therapist and a lifelover from Helsinki, Finland. lookfantastic Beauty Box – is it worth it? You’re never getting rid of your blackheads – and here’s why you shouldn’t! Longer and stronger hair with gummy bears? Search a topic, a brand, a post..